There’s a feeling among some motoring enthusiasts that after a nuclear holocaust the only things that will remain are cockroaches and Toyota LandCruiser 70 series vehicles. They are that tough. People who own them are usually passionate about their go anywhere, rugged performance and the way they will keep doing it for a long, long time. But it is an acquired taste. In the world where the expression four-wheel-drive has given way to SUV and where many vehicles are now considered ‘soft-roaders’, the 70 series is a rough and tumble vehicle that refuses to let niceties dominate its character. Its solid performance characteristics of tough four wheel driving and towing are well suited to farms, construction sites and open cut mines, and are generally up-to-date, but the comfort features are not state of the art for the automotive industry. The very keen grey nomads can also be fans, especially those who are prepared to give up luxury for the security of a reliable can that can be loaded up to the gunnels. Amongst aficionados, stories abound of these vehicles reaching 400,000 to 500,000 km, some claiming to go even much higher. This is a vehicle that only comes with a five speed manual gearbox and air-conditioning is an optional extra. There is no large screen in the centre of the dash board for controlling all the electronics and to adjust the rear vision mirrors you have to reach outside and do it by hand. Only the top of the line model has electric windows. Perhaps surprisingly, it is not cheap. Being a category of vehicle that is suited for such narrow range of specific activities means that while they may be loved by their owners, those owners are few in number. Another problem in trying to produce this vehicle with profitability, is that owners believe so much in the reliability of their vehicles, it can be hard to talk them into trading up for the latest model. In Australia they sell around 8,000 a year and only 70,000 worldwide. For the last couple of years there were rumours that the 70 Series would go the way of the Land Rover Defender and cease production altogether. But Toyota has bitten the bullet and significantly upgraded the vehicle which should guarantee that it will be around for at least another 5 years. The 70 series comes in four body shapes: single cab-chassis; double cab-chassis; troop carrier and wagon. The single cab-chassis is the biggest seller and is the one that gets the most safety features. The single cab-chassis also gets thicker, stronger, more rigid frame – side rails, three additional airbags– curtain-shield (two) and driver’s knee (one) making a total of five. The result is the cab-chassis model has achieved a five star ANCAP safety rating. The 4.5 litre V8 turbocharged diesel engine has been improved with Piezza electric injectors and now produces 151 kw and 430 Nm. These figures are not high so the engine is not over stressed and this adds to its longevity. Nonetheless even thought the torque figure is not high but it is extremely hard to stall the vehicle and it is easy to drive over rough terrain. The previous model had closely spaced gear ratios that felt a bit like a truck but the new five speed gear box has taller gears that make for quieter touring and better fuel consumption however six speeds would have been better. These improvements can save drivers as much as 1.2 litres of fuel over 100km of driving. The combined-cycle consumption is now rated at 10.7 litres/100km, a gain of 10.1 per cent. On the highway the consumption is 9.4 litres/100km. The cab-chassis now has a single 130-litre fuel tank – the same size as specified for wagon and double cab-chassis models. The troop carrier continues to be fitted with two 90-litre tanks. And to make touring that bit easier Toyota has made one major concession to modernity, every model has cruise control. We drove the vehicle through all the hazards of the Melbourne 4×4 Training and Proving Ground. It handled each of the hazards set in front of it. Not only did it cope, but it did it without any fuss. As we entered a creek, or climbed a rocky hill or leaned over at about 30% (which is not its limit but felt quite far enough) the 70 series just ploughed along. You did not need to be a seasoned four wheel drive punter to cope with difficult situations. The only compromise that comes from all this capability is that the turning circle is a huge at 14 metres. Styling is not a purchase incentive. The basic look of the vehicle has not changed much except for a larger bulge in the bonnet which provides more cooling around the engine because the vehicle now has a diesel particulate filter as standard as part of the move to Euro 5 compliance. The higher bonnet also helps in achieving a good pedestrian safety although it is hard to find any one of these vehicles that doesn’t have a bull bar which significantly reduces the chance of a pedestrian being tossed onto the bonnet. All of the LandCruiser 70 series have a 3,500kg towing capacity while the single cab-chassis has the highest payload capacity oat 1220kg. The critical and unusual thing about the 70 series is that you can load the maximum towing capacity and pay load at the same time. If you are towing at the limit in other four wheel drives this significantly reduces the payload you can carry in the tray. The LandCruiser 70 series has never been cheap and the prices for this model have increased. The basic wagon, the WorkMate model, starts at $60,990 plus on road costs, the single cab-chassis starts at $62,490, the Wagon at Troop Carrier $64,890 and the double cab-chassis $64,990. The up market GXL is an additional $4,000 in all models while the single cab-chassis has the has a middle order model, the GX, which is an additional $2,000 over the base model. The main options are air-conditioning $2,761 (including fit); premium paint $550; and diff locks $1,500 (single cab GX, double cab WorkMate). The new range is covered by Toyota Service Advantage capped-price servicing at $340 per service. So the 70 series is well suited for a small range of situations and has developed a passionate following. The latest model makes some significant improvements but comes at a cost. 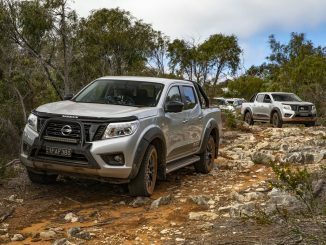 The 70 series is an image leader for Toyota who have built their name in Australia on rugged strength that is well suited to our great outdoors. They have decided to keep trying with the specialist 70 series at least for the foreseeable future. The owners will continue to love them and Toyota just hopes there will be enough of them.